Corcoran's 10" Tanker boot is a prime choice for the soldier in need of black leather military boots. 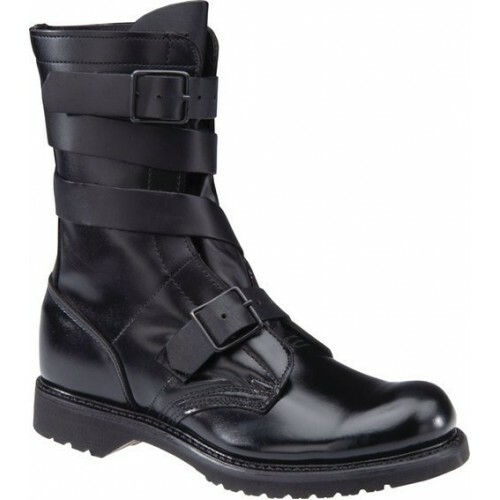 These high-shine boots are a fine choice for the military and are quite versatile in their use. The Tanker boot comes with a PORON cushioned insole, which will help blunt the impact of your steps. Those long hard treks in training won't destroy your feet with these. They have a unique strap enclosure that means less time lacing and more time getting to your destination. The battlefield is strewn with hazards that aren't enemy fire. One wrong step and you can wreck your feet on something as simple as a root. The Tanker boots try to alleviate your worries by giving you some internal ankle support. A steel shank is also embedded in the boot to give you the stability you need in a variety of situations. A soldier needs good grip, and Corcoran aims to give it to you with the oil-resistant semi-lug sole on the bottom of these beauties. The quality of the boots is guaranteed as well through their storm-welt construction. These versatile, military boots are pure quality. Made to last, designed for comfort, and up to any task, the Tanker boot is a fine addition to the soldier's combat attire.